Allscripts will sell its joint venture stake in behavioral technology vendor Netsmart, the company said in its quarterly earnings call Thursday. Allscripts acquired Netsmart for $950 million in April 2016 with the participation of a private equity investor. Seizing on the momentum we’ve created in Netsmart during the quarter, we took further steps to position ourselves to unlock value for shareholders through monetizing our investment in Netsmart. After researching and discussing several possible alternatives, we began detailed negotiations with multiple parties on the sale of our interest. We have signed a letter of intent and buyer diligence currently continues. Based on the work accomplished to date, we expect to answer a definitive documentation on the sale during the third quarter. From the beginning, we set up a ownership structure that was not sustainable for the long term. It meant we were either going to be a seller or a buyer, ultimately, of the rest of that. What our shareholders are clearly telling us today is they don’t put a lot of value on our ownership in that today, based on where our stock is. You’re probably pretty familiar with what’s happening at some of the post-acute assets right now, which are trading at very high numbers. We think it’s in the best interest of our shareholders to let somebody who values this more own it and will reward our shareholders with the benefits of that. It’s really been more of a financial asset than a strategic asset for us and I think it’s the right thing for us to do. Recurring revenue made up 80 percent of the total. The absence of regulatory-motivated buying behavior has extended the software sales cycle and made revenue timing prediction trickier, especially in the hospital market. The company sold its first managed services deal to a former McKesson EIS client. Practice Fusion has had “tens of thousands” of paid signups since the June 1 termination of the free offering. Paul Black says companies that offer only EHR/PM systems, unlike Allscripts, will struggle in a competitive market. The company says M&A has never been a specific strategy, but they’ll jump on deals that increase the Allscripts scale or footprint. From CI-CI-O: “Re: project branding. I’m interested in your thoughts and those of your readers. As we embark on a project to move to a single EHR across our organization, I believe we need to brand this with our own name and avoid having our users refer to the EHR by the vendor’s name. My marketing leader disagrees. There seems to be people on both sides of this debate. Do you think in-house branding a makes a difference in how the EHR is perceived during or after a roll-out?” I think you absolutely should give your project a specific name, for a couple of reasons: (a) the effort goes far beyond that single vendor’s implementation and thus it is your project and your organization’s effort, not theirs; and (b) it needs to resonate with hospital employees who need a better visual than the company name alone can provide. Just don’t name it something goofy or overly ambitious (which is harder to do than it sounds). Skip the employee naming contest and get your marketing people involved to treat it like a business identity project in giving it a descriptive name, logo, and tagline. It sounds woo-woo, but it’s not. Your marketing people seem inept to not be jumping all over this opportunity to show their skill. Readers? 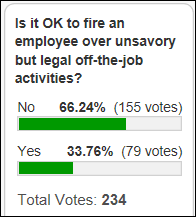 Two-thirds of poll respondents say it’s not acceptable to fire an employee over activities that are repugnant but legal. Nick says it’s just another form of lynch mob for unproven rumors similar to what’s happening in rural India. A couple of folks say it’s fine if the employee agreement contains a morals cause. B thinks companies have a responsibility to create a safe environment and thus to exclude those who promote violence. A few respondents say it’s a slippery slope in defining “unacceptable” behavior. New poll to your right or here: Is it OK that medical bills regularly force people into bankruptcy? Thanks for some good answers to last week’s question. This week’s question: what do you wish you’d known before turning 40? The company’s 9 percent bookings growth included seven contracts valued at over $75 million. Work with the VA and DoD will accelerate efforts in the areas of population health, open platforms, and telehealth. Cerner says its work with Lumeris give it the ability to add provider health plan functionality to HealtheIntent and new markets for Millennium. The Lumeris investment is an example of looking for acquisitions that can provide a faster path to the $100 million level. The VA contract, as expected, had minimal impact on the quarterly results. Hadassah Medical Center (Israel) joins the TriNetX global health research network. Flagler Hospital (FL) will use Ayasdi’s Clinical Variation Management system. A small Reaction Data nurse survey about burnout finds that the most prevalent causes are dealing with internal bureaucracy, work-life balance, and dealing with regulations. The most-suggested solutions for each of those factors are more clinical input, flexible schedules, and reduce regulatory burden. Nurses say the EHR’s biggest problem is poor usability. Redox introduces its medication-related data model, which enables the exchange of new medication orders and modifications or cancellations to existing ones. 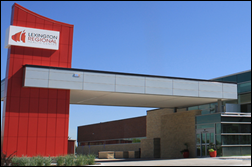 Lexington Regional Health Center (NE) gets board approval to replace its unnamed EHR vendors, explaining that it can’t deal with poorly integrated integrated inpatient, ambulatory, and ED systems and such systems hurt its recruiting efforts. They’ve already chosen an unnamed vendor and can now negotiate a contact. For-profit hospital operator Prime Healthcare will pay $65 million to resolve charges related to Medicare short-stay admissions, with founder and CEO Prem Reddy personally responsible for $3.25 million of the total. It’s hard losing your hair and not knowing when it’s going to grow back, or if it’s going to grow back, and how people are going to look at you. 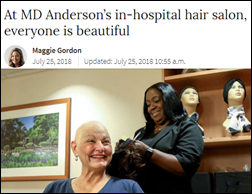 I think most of my patients wonder if their husband is still going to think they’re beautiful. If they’re still going to look at them the same way … I want them to have the confidence and know that they’re beautiful, no matter how they look on the outside. And I think that’s what people really have to start saying to themselves: I’m beautiful … Treating someone nice, it makes them happy. It makes them feel like someone cares about them. And it costs nothing. It’s so free. NPR’s BioTech Nation podcast features MDLive CEO Rich Berner. MedData will exhibit at the HFMA Region 8 MidAmerica Summer Institute 2018 August 6-8 in Independence, MO. Waystar will exhibit at Epic Core August 8-10 in Denver. Clinical Computer Systems, developer of the Obix Perinatal Data System, will exhibit at the AWHONN Texas State Conference August 9-11 in Corpus Christi, TX. CloudWave achieves SSAE 18 standards compliance for its OpSus Healthcare Cloud services. Wellsoft achieves 2015 Edition EHR certification. WiserTogether partners with Peers Health to deliver its Return to Health treatment guidance solution for disability and workers’ compensation markets. Wolters Kluwer Health will begin publishing The Journal of the Association of Nurses in AIDS Care from ANAC.